110 Swimmers take the plunge! After a hugely successful gathering of swimmers and pool supporters for a unique photo shoot, Attilio is now set to unveil his work to the world this Thursday. In a truly humbling display of just how well loved our local pool is, photographer Attilio Fiumarella and the gang over at Some Cities succeeded in getting 110 swimmers together to stand in the empty Gala Pool in their swimming costumes on a sunny Sunday morning to show their love for the building – and dismay at its proposed closure. The shoot was a massive boost to the campaign against the proposed closure of the building – earmarked for September next year. There was such a fantastic, good natured atmosphere – it was so lovely to see so many pool users coming together. Attilio captured a real cross section of the community who gather at the pool each week. The event really illustrated what a diverse bunch we are – babies and toddlers lined up next to pensioners, keen lane swimmers next to ‘Strokes’ pupils, club swimmers alongside the Aquarobics devotees and members of the Friends of Moseley Road Baths next to pool staff. That unique community is what we stand to lose if the pool closes. The powerful images from the photo shoot were picked up by local news outlets, and soon the story grew to become the third most read story on the BBC News site, it was covered in the Daily Mail and we even gained coverage of our ‘Warrior Spirit’ as far away as Scotland! Twitter went wild with the #100swimmers hashtag, and we even got a Tweet from Jeremy Vine! Thanks to everyone who helped to spread the word and who shared their images and thoughts on the day. Esther Barnes documented the shoot and has produced some lovely images. Matthew Walters was one of the ‘Terracotta Army’ who took advantage of the event to take some gorgeous shots of around the building. Proof as ever that this building continues to inspire. Attilio’s image from the photo shoot will be unveiled this Thursday July 31st, from 6.30pm, at The Old Print Works, over the road from the baths – and all are welcome – whether you participated, spread the love online or only saw the story in the press. Attilio will be there to answer questions about the project. 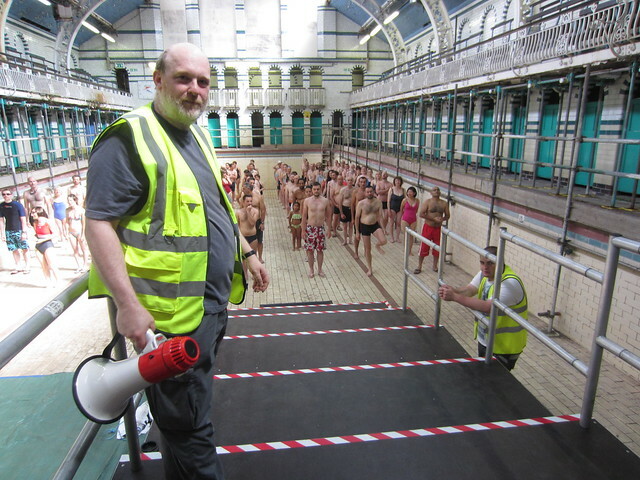 The Friends of Moseley Road Baths want to extend a huge thank you to Attilio for his vision and talent in bringing the project about, the team at Some Cities for supporting such an ambitious and exciting project, Ian Edwards (pictured above with his loudspeaker!) 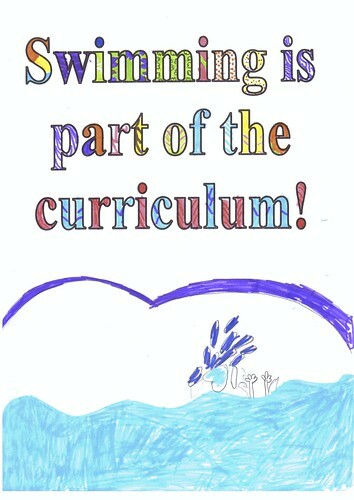 for his expert direction of the swimmers, to the crew who were running round supporting Attilio, to all of the swimmers who gave up their morning to stand around in an empty pool, and of course, thanks are also due to the pool staff for accommodating the event. Over the years loads of people have been inspired enough by the architecture of Moseley Road Baths to use it as the backdrop to televised drama. We are aware of a lovely film about an elderly couple reliving their courtship called ‘The Pool’, a BBC adaptation of DH Lawrence’s ‘The Rainbow’ from the 1980s and an episode of Dalziel and Pascoe, that sees Norman Wisdom collapse in the Slipper Baths. This clip from 1976 is from ‘Gangsters’ which is ‘set in the multi-cultural criminal community of Birmingham’. Ah, even our criminal underworld is multi-cultural. I can say categorically that the staff at Moseley Road Baths would never have allowed someone with such a dodgy walk to go onto the poolside, never mind allow them into the cubicles with a sword… Watch from 4:33.
and then look out for the very powerful broom from 1:30. Have you been involved in a MRB art project? Moseley Road Baths has always been a real inspiration to people doing creative, exciting things. A couple of weeks ago editorialgirl took a tour of the building and took this wonderful selection of photos, which complement her previous collection from 2009’s Flickrmeet for local photographers which we featured on here at the time. Have you ever organised an art event at Moseley Road Baths? Have you ever taken part in one, or just attended? 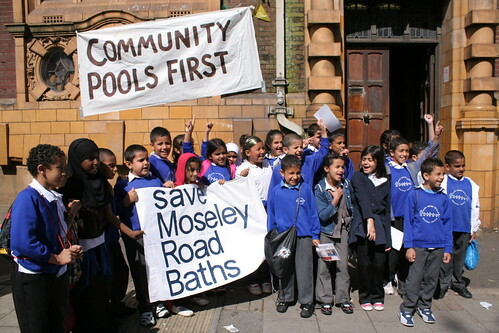 If so, then The Friends of Moseley Road Baths would love to hear from you. As part of our Pool of Memories History Project we’re researching all aspects of the building’s 105-year history. So if it was an art show, a video shoot, fashion show, play, exhibition, TV appearance, or anything else then we’d love to hear from you. Maybe you were at Immerse, Swimming Without Water, saw Stan’s Cafe’s show, or maybe you have a copy of the Gangsters episode which included the baths, or the Dalzeil and Pascoe show that featured Norman Wisdom! If you think you might be able to help, memories or memorabilia (posters, tickets etc), then do get in touch at memories@friendsofmrb.co.uk. Astounding response to Heritage Consultation! 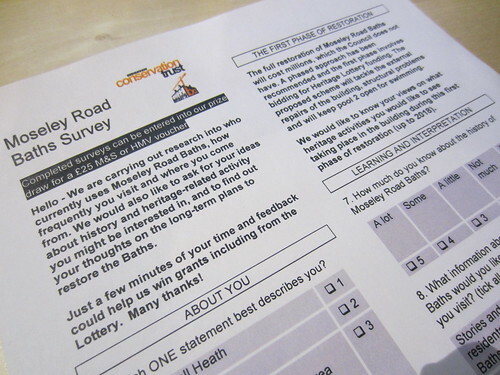 We have seen an overwhelmingly positive response to the consultation work that Birmingham Conservation Trust have been doing as part of the bid to the Heritage Lottery Fund for restoration and heritage projects at Moseley Road Baths. There is a great write up on their blog. Lots of you have been completing questionnaires on your ideas for the building (these can be found at the Baths and many local community venues), there was lots of interest at the Eid Mela a few weeks back, 133 people took a ‘Behind the Scenes’ tour last weekend, every single department at Joseph Chamberlain College has expressed an interest in using the Baths with students, plus this week we are meeting with local schools to discuss their vision for activities at the Baths. Phew! I was lucky enough to meet with Suzanne Carter, part of the team from Birmingham Conservation Trust conducting the consultation, and representatives from local arts organisations. We took a tour around the building, delving into nooks and crannies. It’s so inspiring and affirming to see people getting visibly excited by the possibilities in the space. We spoke about how the individual cubicles for the slipper baths could be used creatively, how the archive from the Pool of Memories could be used as inspiration, and we got very excited talking about how everything from the smallest detail of the tiles and marble to the huge expanse of the Gala Pool could be employed for photography, film, projection, dance and drama. It’s clear to me that we have a really wonderful opportunity to combine the heritage and beauty of this inspiring building with the creativity and talents of local people. Let’s push to make sure that we can make these things happen! We have just posted up a new page with the most recent timetable for the Baths. Please note that this is correct as of today’s date but it is subject to change and we urge you to contact the pool directly on 0121 464 0150 to check for any changes. 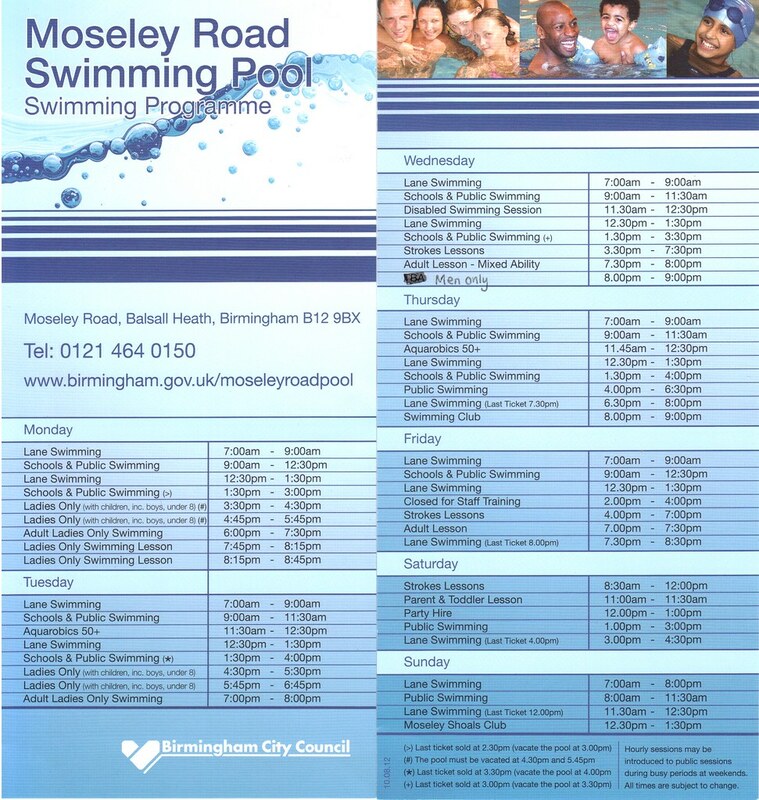 Timetables are also available from the pool along with details on how to register for a Passport to Leisure card if you qualify for cheaper swims, and direct debit options if you are a regular user of the pool. 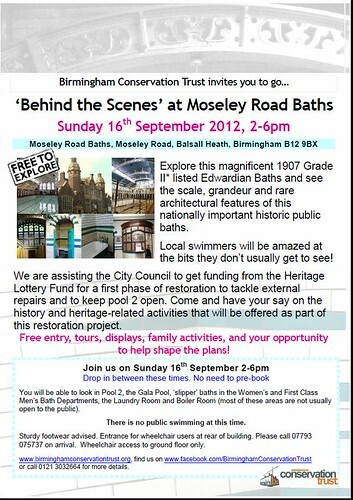 ‘Behind the Scenes’ at Moseley Road Baths! This Sunday, 2-6pm there is a rare opportunity to delve behind the scenes of the Grade II* listed building to see how the pool is run and to see bits of the building not open to the public. This is as part of a consultation exercise looking into ideas for a restoration bid to the Heritage Lottery Fund. No need to book – just turn up!